A new student movement at Harvard Law School is organizing to change the seal at the school, which the students argue represents and endorses a slaveholding legacy. The seal is the coat of arms of the family of Isaac Royall Jr., a slaveholder who endowed the first professorship of law at Harvard. Dubbed “Royall Must Fall,” the movement styles itself after a student activist movement in South Africa that lobbied to remove imagery of Cecil Rhodes, a British imperialist, from the University of Cape Town’s campus. At Harvard, activists formally began their effort for change with a rally of about 25 people on the Law School campus on Oct. 23. They have launched a Facebook page and are now in the process of further organizing. They are drafting a letter to send to the Dean of the Law School Martha L. Minow with their positions, according to Mawuse H. Vormawor, a Law School student and organizer of the effort. Students involved in the effort argued that imagery from a slaveholding era has no place at today’s Harvard Law School. 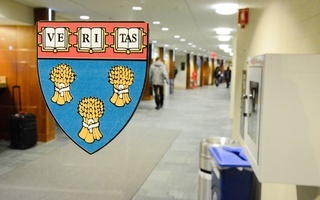 “These symbols set the tone for the rest of the school and the fact that we hold up the Harvard crest as something to be proud of when it represents something so ugly is a profound disappointment and should be a source of shame for the whole school,” said Alexander J. Clayborne, one of the Law students involved. Vormawor pointed to the research and scholarship of visiting Law School professor Daniel R. Coquillette, who recently published a book about the first century of Harvard Law School, as inspiration for the movement. In the book, Coquillette details the relationship between the Royall family’s slaveholding and the endowment of the Law School. While Coquillette said he was sympathetic to their aims, calling Royall “a coward, and a brutal slaveholder,” he said he does not think the Law School should change its seal. The current student movement is not the first time the Law School’s slaveholding legacy has been examined on campus. When Janet E. Halley was appointed the Royall Professor of Law in 2006, she delivered remarks that explored the relationship between Royall’s slaveholding wealth and Harvard Law School. For student activists, the movement is still very young—just weeks old—and still subject to change. “Inasmuch as this is a conversation that we are having on this issue and even though this movement is called ‘Royall Must Fall,’ it is not closed to suggestions,” Vormawor said. I was saddened by the news account of protests at the Brandeis ceremony where Law School Dean Martha Minow received a well-deserved award for her scholarship in human rights.